Alright, so here’s a list of all the games I made this past semester. I wanted to jot down some thoughts about them before they all go the way of tears in rain. “War & Loyalty” September 8th 2015. Card Game. Co-designed with Danny Nanni & Seth Scott. Our first assignment in design class was to ‘fix’ a broken game, and my team was assigned the card game War. It was a great way to dive into the program and get used to constantly designing things. We worked on solving the biggest issue in War, namely the complete absence of any choice whatsoever, by introducing a system where you and your opponent drew and placed cards. Our solution was pretty okay! A little clunky perhaps, but definitely more fun to play than the original War. More interestingly though, we wanted to solve the fact that War goes on forever by eliminating the card replacement mechanic. Inadvertently, we created a sort of reverse deck builder, where at the beginning of the game your deck is mixed, and through smart play you can strategically lose bad cards to create a statistically better deck over time. It was actually an interesting mechanic, and we only stumbled into it through playtesting, the value of which was a good lesson to learn early on. “What’s Your Deal?” September 15th 2015. Card Game. Co-designed with Blake Andrews, Sean Heron, & Christian Sutton. For our second assignment in design, we were tasked with making an abstract game with a given set of constraints. My team got bidding and hidden information. In just a week we actually came up with a pretty neat bidding game. Players were assigned one of five secret goals at the beginning, like “Collect 4 Hearts”. Then, cards were revealed and bid on by the players. It created some neat moments of misdirection. We struggled with the economy though, and the clever mechanic we eventually came up with was having the money stay internal to the system. Each turn a player became the “auctioneer”, and the money from the winning bid was given to them. So in addition to considering how much you wanted to bid for a card, you had to do so knowing the money would go to another player (potentially letting them outbid you next turn). The game needed some tweaking, but it was definitely a solid foundation for a competitive group game. “Put Your Best Foot Forward” Date unknown. This is a game I proposed at a brainstorm that was based entirely around the title. Players had… foot cards? And you had to… bid on something… shoes maybe? The only certainty was that each turn, players had to put their best foot forward. The awfulness of the idea, coupled with its nebulous nature, meant it was called forth and jokingly iterated on throughout the semester. Christian contributed the amazing tagline “The game’s a foot!”, which doubles down on the feet puns, and Blake suggested the central mechanic should involve, obviously, players actually sticking their feet forward as the game pieces. Put Your Best Foot Forward remains an enduring example of the advantages and disadvantages of trying to design a game solely around a punny name. “Ascend or Die!” September 22nd 2015. 4-Player Board Game. Co-designed with Blake Andrews, Sean Heron, & Christian Sutton. This was the first game I worked on that definitely looks like a finished game. Well, except for the monster token I guess, which still looks a bit placeholder-y. Ascend or Die! is a four player board game where the players are mountaineers attempting to climb an inhospitable mountain. There was a day/night cycle (tracked by a sun counter along the outer edge of the board), and players had to gather resources during the day and return to camp at night to ascend a level. There’s an “AI” controlled monster as well, who just randomly moves around and causes trouble. There was some good elements, but unfortunately it sort of ended up as a children’s game since the core movement was pure dice rolls, and the only choice the players had was which direction to walk in. So while there was some tension in the “do I try and get more supplies, or head back to camp early and play it safe?” decisions, it was a little too random in the end which robbed the player of meaningful agency. But still, I’m pretty proud of it given that’s the result of one week of design work. “Spice of Life” September 23rd 2015. I’m most proud of two things here (besides it being a relatively complete game experience). First is the time mechanic. As you get points, the game speeds up; you move faster, the enemies move faster, enemies spawn faster, and the music itself speeds up(!). This makes the game easier as you’re doing well, since you can rack up more points. But it also makes it harder, since you have less time to course correct and get a wrong colored dot. So the game also slows down when you’re doing poorly, which makes it harder to score high but easier to get the right dots. I really like that system, and can’t believe I got that all working in two weeks. Secondly I’m also proud of the randomized AI; each enemy has a range of parameters like their run speed, their perception distance, etc, and they’re randomly determined when they’re created. This makes them feel a little more random and alive as you play, because every enemy is different. You might chase down one no problem, but find another one dodging you better, or another chasing you for much longer. I think it makes it feel much less mechanical overall. Anyway you can go play it for yourself! It’s mostly bug free, and it only takes a minute to play, check it out. Social Game. Co-designed with Zachary Barash, Patrick Ford-Matz, & Michelle Senteio. Our next assignment in design was a “social game”, which I was initially apprehensive about since it’s not a genre of games I’m particularly familiar with or really like. But I think we developed something that was actually pretty good. It was a sort of voting game for a group of five to seven players. Two players would serve as the “candidates”, and then a question would be read about them, like “whose singing could soothe angry beasts?”. Then the other players would close their eyes and point and the candidate that they thought best fulfilled the question. Then the winning player would get points, but so would any voters who voted for the winning candidate. So it required this sort of weird social calculus, where you had to consider not just who you thought should win the question, but also who you thought most other people would think should win. That dynamic, along with the really funny questions, made it pretty fun to play. It was also one of the first games we had time to more thoroughly playtest. We playtested it quite a bit, and even used written feedback forms. One of the main lessons of the semester has been just how unbelievably vital playtesting is, and this was one of the main examples. In particular we had this great element where players would sort of give little speeches to try and influence voters, like about how they would best fulfill whatever the silly question was. We liked it so much we made it explicit- like, candidates got a few moments to give a speech. Making it explicit though made that become the whole game, and changed it from a funny little side activity to the primary thing players were caring about. In the end we took a lighter touch in the rules, so players could be tempted to speak if they wanted to but not be forced to. I love those sorts of discoveries, the sort of things you only find through iterative experimentation and testing. Procedural story. Co-designed by Danny Nanni. This was just an in class assignment we did as an exercise as an introduction to games and narrative. So it was made in just about half an hour or so. It was based on Eric Zimmerman’s “Life in the Garden“, a procedural storytelling game where random pages are assembled to form a narrative. So we wrote up around ten or so, and you deal out four to form the middle of the story. It’s set on a loop above with an example story, the title page is the beginning. We made ours about an astronaut exploring a deserted lunar colony, which is perhaps a bit more pulpy and lowbrow than Zimmerman’s biblical original, ha. But I think it came out well nonetheless. I really like procedural narrative as a concept, so it was fun exploring it in analog. “The Walker” October 14th, 2015. For our first real digital game in Phaser, we got three whole weeks to make something. For some reason, I had this idea to try and create a game about mechanical linkages, specifically a Jansen’s linkage. I think they’re really beautiful and love the way they move. As a game though… eh. So The Walker has you controlling this little walker robot, but it isn’t an animated sprite or something. It’s actually a dynamic physics simulation, with the entire structure of its legs being modeled in realtime using hinge joints. So you don’t actually control the legs, you control the little rotors which move the whole contraption. Which is kind of cool, but “To what end though! ?” I ask my past self. It took so long even getting the game remotely playable. I think I had an entire week where the whole structure just exploded whenever a foot hit the ground. I am proud of the art direction, basically all of that was done in just a few days. Using a collage of metal textures and ruined buildings, it has a nice apocalyptic cityscape feel. The sound design isn’t great, but I do like some of the metal clanging I was able to work in. You can play it if you’d like! Unfortunately it has two major bugs: hitting the left wall messes everything up, and sometimes if you fall down a pit the wrong way the camera gets screwed up permanently. Just refresh the browser in either case. But give it a play, and see the folly of making a meticulous physics system that ultimately results in merely controlling a weird floaty robot. “The Story of the Drowned Village” October 27th, 2015. Narrative Board Game. Co-designed with Rizky Winanda and Noca Wu. Ahh, this game. On one hand this was a total pain, just weeks of banging our heads against a wall, but on the other had some great ideas and lessons. For our three-week long narrative game assignment, we were given a Grimm’s fairy tale to replicate procedurally. We got the literary classic “The Louse and the Flea” which is a weird chain tale. A louse burns herself, and so the flea starts crying. The door asks why the flea is crying, and she explains it’s because the louse burned herself, and so then the door starts to shake. The broom asks why the door is shaking, and he explains it’s because the flea is crying, who is crying because the… and it goes on this way for awhile, until the river hears about it, and then he floods the whole town and kills everyone. We felt there was a weird moral about spreading sadness there, so we tried many, many iterations of games where you tried to find out other people’s emotions, and if they were sad then you became sad too. And if the river became sad everyone died. It was maybe two weeks of various false starts on this theme. Ultimately the pretty genius idea we went with (proposed by the inestimable Noca Wu), was that rather than trying to depict the events of the story, we suppose they already happened. So the players are investigators trying to discover what happened to the destroyed town. So we had a ruined town board for the players explore, and they try to piece together story fragments and deduce what happened. But there’s also a ticking clock in that the flood waters have only receded temporarily, so you need to get in and gather clues and get out before it floods again. This premise really worked well, and I think we could’ve made something really good, but unfortunately we didn’t have quite enough time for fine tuning and balancing by that point. So the ultimate game was pretty promising and had some fun moments, but also had some broken interactions (like a small possibility for the game to kill all the players by like, turn 3) that needed ironing out. I’m still very proud of the framework for it though, I think there’s a lot of potential in that sort of procedural archaeology setup. “Cyclops, Look Away” October 28th, 2015. My first game in Unity! This was another little intro game, where we had two weeks to fix a weird broken game. The sample was a game where triangles fly at a circle, and you need to keep a dot in the circle while it bounces around from the triangles’ impacts. The dot within a circle made me think of an eye, so I made it an eyeball that looks at where the cursor is. I changed the triangles into bees, which now fly out and try and get into your eye. You protect it by looking away so that your eyelid blocks the bees. As bees get into your eye, your eyelid closes, so it gets easier, but it also gets harder because there are more and more bees. And you just try to survive for as long as possible, the bees always keep coming and you can’t really win. That was the intent anyway, I didn’t quite finish it. Instead of the game ending when the eye fully closes, the eyelids just start spinning around endlessly as an infinity of bees swarm into the eye. And the buzzing sound effect of the bees eventually coalesces into this hellish unending crescendo drone. So… yeah, I created a pretty nightmarish game I guess. “Good Taste” November 10th, 2015. ‘Intervention’ Game. Co-designed with Blake Andrews, Zachary Barash & Hannah Monck. After the lengthy (by the standards of the semester) narrative game, we had a week for a palate cleanser project, which was an intervention game. That is, a game which by its nature causes players to re-contextualize something familiar and consider it in a new light (I’m paraphrasing). MAGNET, the NYU facility that houses the Game Center, very quickly becomes a home for the MFAs, since we spend so much time there, but it’s also a space populated by so many strangers, since we share the floor with a number of other programs. So it’s a space that is at once familiar and filled with friendly faces, but also filled with people you don’t know and sort of ignore. 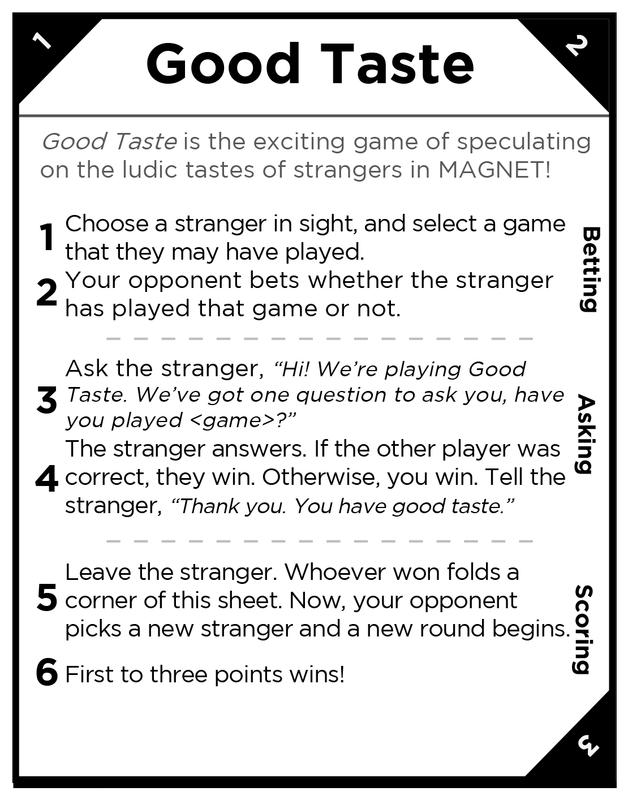 This game uses those strangers as game pieces, and forces you to consider strangers’ tastes as a sort of combination trivia and empathy game. This was inspired by a “game” I had played with Christian at an event, where he bet me that we could ask ten people and none of them would have played the classic puzzle game Lemmings 2: The Tribes (… he won). In Good Taste, players speculate about a game a stranger may have played, and the other player guesses whether they have or haven’t. This has a nice balancing effect, as you try and pick something that could go either way- you can’t pick something too obscure or too obvious. I think that as an intervention into a social space, Good Taste is only so-so. But it is actually pretty fun to play, with strangers as well as friends. Those are the full rules up there, so you can play it as well… if you’re in an environment filled with games-related and games-adjacent people. It requires a pretty specific game piece, admittedly. “Minus World Games Trivia Night” November 12th, 2015. Bar Trivia Game. Co-designed and hosted with Blake Andrews & Zachary Barash. This wasn’t for a class at all! For a long while I’d been wanting to go to a games trivia event. I like bar trivia, but while you can find trivia focused on specific pop culture properties (like, Ghostbusters trivia, or whatever), I hadn’t been to a live event about games trivia. So, being the change I wanted to see in the world, I dragooned two of my like-minded classmates into putting on an event at the Game Center. It was a lot of fun! It was perhaps ambitious (read: dumb) to try and put something together like this during a particularly busy time of the semester, but I’m glad we did it. It also made me appreciate just how difficult writing trivia questions is. A good question is a sort of puzzle or riddle, that seems difficult but can actually be figured out fairly reasonably. You can’t ask things that are too obscure, otherwise no one will know them, but they can’t be too familiar either otherwise it isn’t enjoyable. My favorite question was an audio one, where we played sounds and you had to name the game they were from. One sound was the dog snickering noise from Duck Hunt, which is a very famous sound effect and pretty easy to identify. But, stripped of its visual cues, it’s actually a sort of abstract sound, so it’s not immediately obvious. That was a good question. Others we had were less so, but on the whole it was all pretty good. I think having it at the center was a mistake though. Like, wow, does bar trivia sure change substantially if you’re not actually at a bar. It changes the nature of it completely, because there’s no idle chatter or general hanging out, and it becomes a much more tournament-like atmosphere without all that. I think it was a really good lesson in context and physical space, which is an easy factor to ignore when crafting a game experience, but is actually vitally important. “Heliotrope” (Version 1) November 18th, 2015. For my three week Unity game, I continued my tradition of weird experimentation style game design. This began as an attempt to do a procedural city builder. I had this little system for generating “buildings” (cubes) which would place themselves randomly and be of random heights. It actually produced kind of cool looking cities, but I wasn’t sure what to do with it. Someone suggested that maybe it was a plant, instead of a city, and so I created this thing where the player generates sunlight, which grows this procedural plant creature. I had this idea of it being a puzzle game, where you’d have different plants with different behaviors and you’re trying to grow them all in balance. Like, a plant that likes the sun, but also a second one that flees from it, or something. Unfortunately I wasted a lot of time on side issues I should probably have ignored, like making the sun look good. That bloom effect on there took me about a week to figure out (turns out its sort of tricky to signify light when it doesn’t have objects to hit), and I probably should’ve just done something that looked bad and worked on the dynamics of the system more. Still though, I can’t describe the feeling of gratification from the first moment that I got the plant working. The logic was all coded, the script worked, and when I pressed down the mouse the sun illuminated and the plant grew to reach it… pure poetry! This is why people fall in love with procedural systems, it really sends shivers down your spine when you have these moments when you get to yell “Life! I have created life!” like a mad scientist. “Merchants of Shifting Seas” December 15th, 2015. Board Game. Co-designed with Michelle Senteio & Noca Wu. Our final project in game design was a four week project to make whatever we wanted with whoever we wanted. We had a pitch session in class where we all said the sort of things we’d like to work on, and groups formed over shared interests and designs they wanted to explore. I had the immense privilege of getting to form a group with with two designers I had worked with on previous projects, Michelle Senteio and Noca Wu. I got to work with some truly amazing people this semester, and it was great to have a shared vision with two designers I really got along with. Our initial premise wasn’t that concrete, but we wanted to make a Euro-style game that focused on exploration and didn’t feature direct or military conflict between players. I haven’t been talking a lot about process so far, but I think how we developed this game in particular really worked well and is worth a mention. We had a system of “stakes in the ground”. When you’re designing a game, the full infinitude of potential ideas can pull you in all sorts of directions and make it hard to make anything at all. So we had this system of general idea brainstorming but with periodic commitment to particular ideas. So our first ‘stake in the ground’ was that it’d be a board game, about exploration, without direct conflict. So from there, we were committed to the notion that even if we had some cool idea, we weren’t going to backtrack on those constraints, and subsequent ideas had to treat those as constraints. Later on we had the idea of procedurally generating the board by revealing tiles, that became another stake in the ground, and so on. By gradually making commitments like this, we could iterate on lots of neat ideas, but while still making gradual progress on something. Rather than constantly starting from scratch with like, “well, what if we made a game about feet…” we were always getting further towards something. The game went through a lot of iterations as we explored different things, but a shape slowly formed of a game about nautical exploration and trade. Because of our process, it really felt like sculpting something out of marble, where this final game was slowly revealed (ha, I mean, not that it’s Michelangelo-level good or anything). We still had dead ends of course, like we spent a lot of time experimenting with physically representing the cargo. You’d sail around, pick up goods and put them on your boat, and sell them somewhere else. It was just so slow and finnicky, and out of scope to balance a system like that in just a few weeks. We also received really great feedback from our professor during status checks, and he helped us hone in on what was working well and what was overly complicated. Eventually we came up with the idea of abstracting the goods entirely and just creating trade routes. So in the final game, you sail around and gradually reveal and map, and link supply and demand in order to form a trade route and make money. The procedural exploration of revealing tiles is really pretty fun. You start out of with an empty map, and gradually reveal it to see what the ocean holds (a process inspired by Civilization V, actually). This can create too much variance though, with one player potentially getting too many good islands near their starting position. We solved this by introducing some statistical smoothing; by dividing the map into shallow and deep regions with different tilesets, as well as “known” islands in certain parts of the board, we could balance some of the randomness so that no one received too great an advantage due to luck. We really went all out on the production values. Probably overboard, really, but it felt good to put in so much hard work and have such an amazing final product. We laser cut all those hex tiles and painstakingly glued all the artwork to them. So much glue. The art in particular was simply fantastic, done by Noca who was/is an accomplished graphic novel illustrator prior to entering the program. The sepia of the old map board, contrasted with the beautiful blue ocean tiles, is really visually arresting. And check out the cute sea monster on the box cover! Oh that’s right, we even had a fricking box too. With inserts to hold all the tiles and game pieces! As I said, it was probably overboard, but it was great to go all-in with two great teammates. There’s nothing like working with amazing people, making something as good as you possibly can. Merchants of the Shifting Seas still needs some additional elements, so further balancing and playtesting and so on, but it absolutely feels like it could be an actual published board game. It was a great high note to end the semester on, and felt like a culmination of everything we had learned prior. “Heliotrope” (Version 2) December 16th, 2015. Heliotrope, now with texture maps! This is like the HD remake. So for our final project in digital design, we had to take a prior project and improves its game feel. I did not relish the opportunity to go back to The Walker, or Phaser, so I was happy to have a chance to continue work on Heliotrope. The game is essentially the same, but I added a lot to improve the experience. The most obvious is the visual style. I tried doing some quasi-realistic plant and soil textures, but they never felt right. I think using Japanese washi paper really worked well though, they gave it a more organic and naturalistic feel, while still remaining abstract. The plant itself is a bit different too, it no longer grows by suddenly jumping in height, but instead grows in a visual tween. There’s also a light particle effect when they pop into existence too. The other major addition was music, the original Heliotrope had no sounds at all. Now when the plants grow, there’s a pleasant violin note, and when it expands, a random piano note plays. With help from my little sister on what notes to use, the plant now plays little procedural arpeggios as you grow it. Oh and there’s a bad plant that gets in the way (barely visible in the top right in the example gif), and it plays horn notes instead of piano notes. Because horns are bad news. I think the game is worlds better with all these improvements, but sadly it’s still not much of a game! I’m going to put some more work into it so there’s a little bit more structure, and then I’ll put version 3 up on my site to play. And that was it! A flurry of experiments at the start, and some more developed pieces towards the end, all of them a blast to work on. I’m so excited to dive back in next semester!